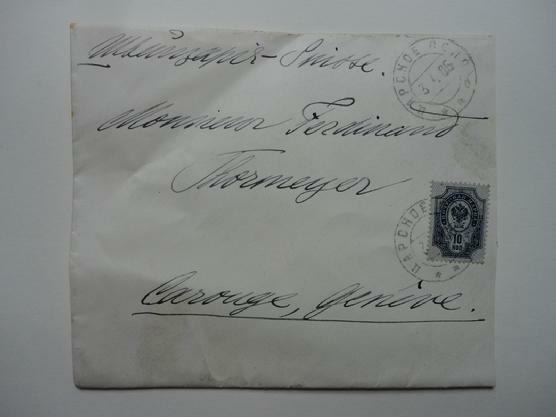 A cover letter from Grand Duke Michael Aleksandrovich to his former tutor Ferdinand Thormeyer in Carouge, Switzerland. Cover canceled in Tsarskoe Selo, on 3 April 1905, and in Carouge, Switzerland on 19 of April 1905.Grand Duke Michael, the youngest son of Tsar Aleksander III and the brother of Tsar Nicholas II, was heir to the throne at this time. Nicholas abdicated in Michael’s favor in March 1917 but Michael refused the crown. He was the first Romanov to be murdered by the Bolsheviks in June 1918. Thormeyer tutored the children of Tsar Aleksander III in French language and literature from 1886 until 1899. Original and extremly rare item, from Romanov Dynasty. This is a fantastic and very rare cover envelope handwritten in his typical distinctive handwriting by Grand Duke Michael of Russia, brother of Tsar Nicholas II and murdered by the Bolsheviks, it is addressed to his tutor Ferdinand Thormeyer in Carouge Switzerland, and dated 1905.
envelope size: 10.5 x 12.5 cm approx. letters star in $ 400,000 Geneva sale ! Tsar Nicholas II's brother has often been overlooked since his murder in 1918... Until now ! Geneva-based based auction firm has Hôtel des Ventes has added to the buzz surrounding Russia with its sale of a highly important and unique collection of extensive correspondence, photographs and drawings. In the end, the collection brought almost four times it pre-sale estimate. It comprised correspondences between H.I.H Grand Duke George Alexandrovich, H.I.H Grand Duchess Xenia Alexandrovna, H.I.H Grand Duke Mikhail Alexandrovich and H.I.H Grand Duchess Olga Alexandrovna and their private tutor Mr Ferdinand Thormeyer of Switzerland. Overall, 35 letters by written by Grand Duke Mikhail between 1902 and 1911 emerged as the highest lot, selling for 34,000 Swiss francs (about $34,600) above their estimated 5,000-8,000 pre-sale value. Grand Duke Mikhail Alexandrovich of Russia remains something of an untapped, even forgotten, niche for collectors of historic Russian memorabilia. Mikhael originally succeeded his grandfather, Alexander II, as reigning Emperor of All the Russians, but deferred his acceptance of the throne until an elected assembly was approved. Before being confirmed as Emperor, Mikhael was murdered in the wake of the Russian Revolution of 1917. Given that his reign lasted only a few hours, Mikhail is today an often overlooked footnote in Russia history, overshadowed by his brother Nicholas II who became Russia's last de facto Tsar following Mikhail's death. Nevertheless he is sometimes referred to by historians as Michael II, and his memory apparently burned strong at Hôtel des Ventes' Geneva sale. Elsewhere, 38 letters spanning Grand Duke Mikhail's childhood, written between 1892 and 1899, were estimated at 5,000-8,000 and brought 29,000 Swiss francs (nearly $29,600). Also from Mikhail's childhood were 35 notes and drawings, which impressively exceeded their 400-600 estimate to bring 16,800 Swiss francs ($17,100). Also auctioned was a unique piece of memorabilia: a rose gold and silver cigarette case presented by Nicholas II and his brother Grand Duke George to their tutor, estimated at 5,000-8,000 and sold for 32,800 ($33,400) Swiss francs. In total, the sale netted 390,000 Swiss francs (just over $397,500). On March 16, Grand Duke Michael renounced the throne that his brother left for him. Fearing that another tsar would only encourage the revolution, Michael at least had the foresight to see that a drastic change was necessary to keep Russia from imploding in on herself. With the grand duke's renunciation, the 304-year-old Romanov dynasty came to an abrupt end. Within sixteen months, the last reigning tsar, Nicholas II, and (according to very few) the technical last tsar, Michael, were both murdered by the Bolsheviks. Michael was living in a hotel in Perm with his butler, until one night in June 1918, when they were abducted by Bolshevik soldiers, hauled into the woods and shot. A month later, Nicholas and his entire family were slaughtered by their guards.